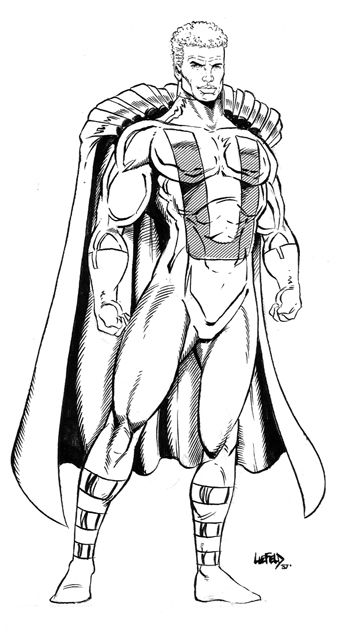 Rob Liefeld was only 16 or 17 years old when I first heard from him in 1985 or so. I was probably working on the 4th issue of Megaton at the time, looking for replacements for artists who had gone on to bigger and better things. 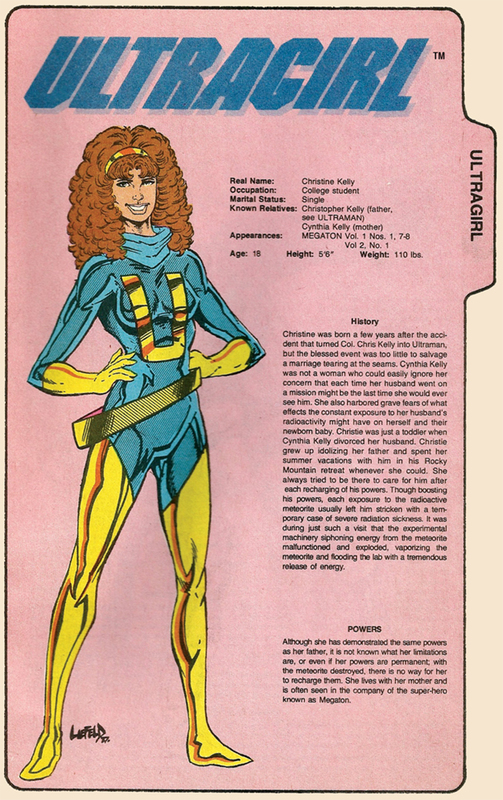 His style showed a lot of George Perez influence and his storytelling was pretty nice and clean. There was some goofy anatomy going on – – but I liked his work a lot. (What can I say – the Legion and Teen Titans were two of my all-time favorite books too). I wrote back to him in California, saying close but no cigar. Within weeks he sent me another batch of samples and these were even better than the first ones. Then another one came. 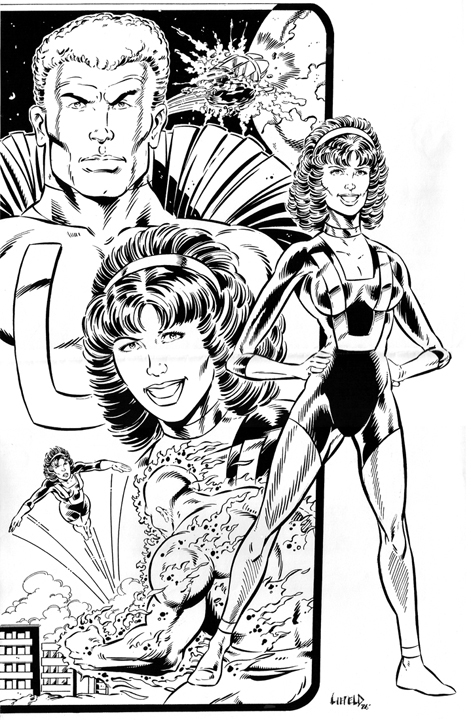 It included four pages of a proposed Berzerker story, and Ultragirl and Ultraman pieces, all characters that hadn’t appeared since issue #1. 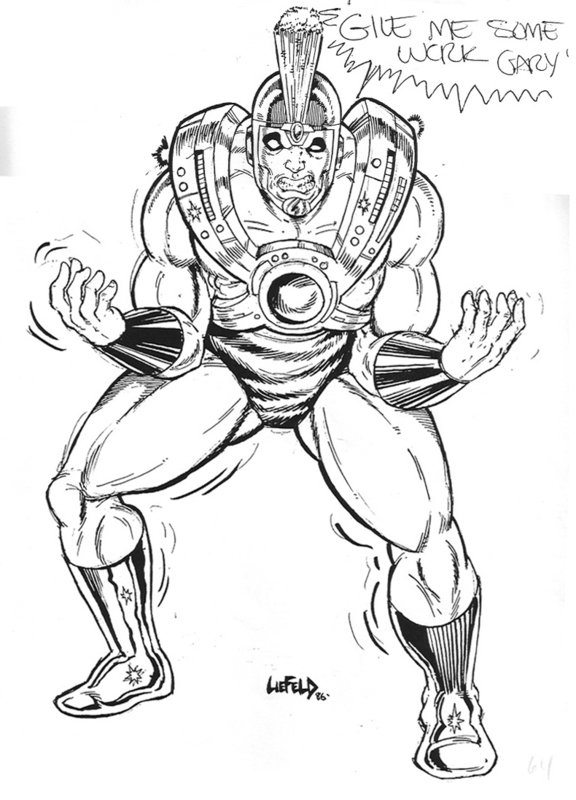 I used one of the pieces he sent as the inside front cover to Megaton #5 and another in our Who’s Who book Megaton Explosion. Out of the blue he called me and said that he was in the Chicagoland area and asked if we could meet somewhere to talk. I think he was visiting relatives. My buddy Chris Ecker and I hopped in the car and drove out to meet him in the lobby of the Ramada O’Hare motel, the annual site of the Chicago ComiCon back then. It was also about halfway between Elgin, where we were and Gurnee, where Rob was. Rob turned out to be a teenager who didn’t even have his driver’s license yet. I think his Uncle drove him out. But he was a fun guy, very excited about doing comics. We talked and looked at more of his art and both Chris and I came away impressed. I gave Rob a plot to draw to see what he could do with it. The story saw print in Megaton #7 but it was drawn by Gary Thomas Washington. Rob did layouts for the entire story which were very good. 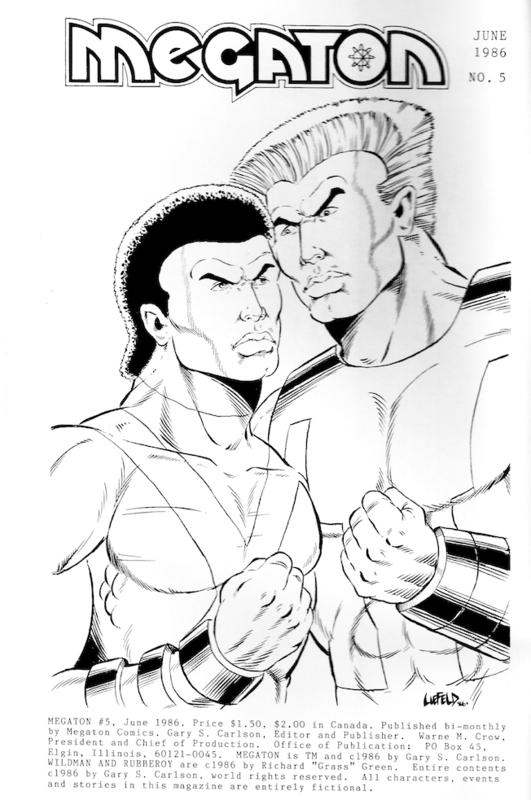 But in the meantime he began sending me character designs for a super hero team he was calling Youngblood. We decided he’d be better off doing a one-shot featuring his own characters, but he drew the back-up story that ran in Megaton #8 to introduce him to our readers. It was a blast working with Rob for that time between 1985 and 1987. Rob’s enthusiasm was contagious and his art was improving by leaps and bounds. The only other guy I ever worked with that loved comics so much and sent me stacks of drawings of my characters was Chris Samnee, ten or so years later. We talked a lot via phone and had big plans. Unfortunately, the independent comic market was glutted back then and my plan to expand to multiple books to be taken more seriously as a publisher was exactly the wrong thing to do. Megaton Special #1 starring Youngblood was solicited and received orders for about 1,200 copies. I gave Rob the bad news and told him (and everybody else) he might as well stop working. Our “Megaton Explosion” plan to expand into multiple books turned into an implosion and I dropped out of comics for five years. It didn’t surprise me that Rob turned into a comics superstar within five years, although it was a real kick seeing the young guy we still called Robbie starring in Spike Lee’s Levi Jeans ads on TV. I visited with Rob for a while at a local comic convention in 1991, amazed at the long line of people waiting for him to sign their copies of New Mutants and X-Force, and he told me of his plan to leave Marvel to publish Youngblood. Once again his enthusiasm was catching and I decided to give comics another try myself, starting with Berzerker and its back-up feature, Big Bang Comics. 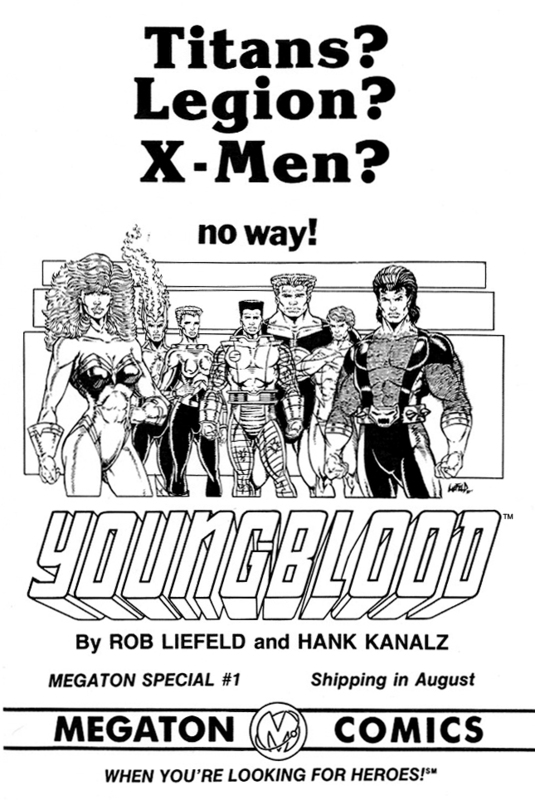 Youngblood and related characters are copyright and TM Rob Liefeld.